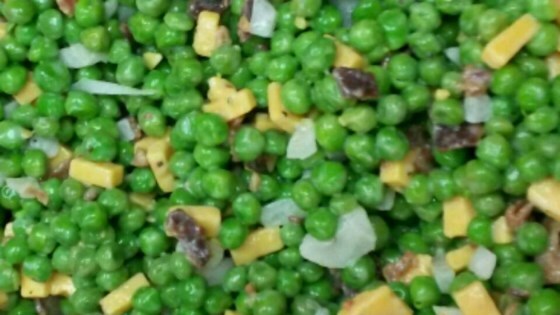 "This is a really simple side dish featuring peas and cheese. I double the recipe and take it to many family gatherings." In a medium serving bowl, mix together the peas, Cheddar cheese and onion. Stir in the sugar and creamy salad dressing. Chill for at least 1 hour before serving. Watch Chef John make an easy, healthy broccoli side dish. This is great!! I used frozen thawed peas instead of canned (salt intake) and it was wonderful! It gets requested at least once a week! I only gave this 3 stars because it lacked the chopped boiled eggs and the sugar should be omitted since the miracle whip itself is sweet. Otherwise follow the recipe. Quick, easy, great taste, and cheap! Can't ask for more than that. It's much better made with thawed frozen peas, though. It's on my regular rotation for summer; we'll be eating this often. Very good. Used frozen peas (thawed), cubed colby cheese, hard boiled eggs and bacon pieces. Delicious!! This is a very easy-to-make recipe, and it usually gets good reviews when I take it to potlucks. I add chopped boiled eggs and don't use the sugar, however. Easy and Excellent! I wouldn't change a thing.